Just like the original Cooking Mama game, the setup is pretty to the point, but this time there are a lotmore options, so navigation is a little harrier, but not impossible. Cooking Contest houses the Friends Challenge, but the demo is again in the "Options" menu, which newer players might not even look at. A "Multiplayer" option is still requested. The opening credits are mostly forced, but at least they're short. Download time is acceptable and even good, considering how much data is sent. Menu options are large, with proper touch sensitivity. Because the menu options are so large, no buffer space is provided sometimes, but none is needed. Labels are clear, large, and understandable. Just like the original, all of the controls are entirely touch-screen based. They make sense for the actions being done and are responsive when times and aimed properly. The controls don't go too far out of their way to make you succeed (that would be bad, since there'd be no challenge left), but they are intuitive. The arrows that guide some of the actions, however, are annoying and generic, and sometimes they even give you a false impression of exactly where to begin an action. They can easily be worked around, it's just frustating for a minute or two. The graphics of Cooking Mama 2: Dinner With Friends are a combination of slightly more sugar-shock-inducing version of the first Cooking Mama, with more photo-realistic foor thrown in for good (creepy) measure. All of the friends - like Mama - look like cousins of MySims/Miis. The music works as a mood-setter: it isn't necessary, but it keeps the tone of the game. The sound effects, like the original, help to make the title, so playing with the sound on is highly recommended. As far as features are concerned, Cooking Mama 2: Dinner With Friends has more content than the first, but it's only a half step up. The first game featured a downloadable demo. This game also features a demo, but it adds on Friends Challenge which is, essentially, a task contest. It's basically the preparation of one of the ingredients or one step in the cooking process at a time. It would have been nice to see a full-on Vs Play cooking competition, a la Iron Chef or the Wii version of Cooking Mama. The Cooking Mama games are cute, strangely addictive, and (when it comes to some of the photo-realistic food) occasionally creepy. They're a combination of microgames strung together with the combined goal of preparing a recipe. I personally know several people that haven't played the series and don't get the point, but casual gamers and inexperienced gamers will find the game fun and many die-hard gamers (including some I know) still have the same drive to succeed as in any other game, giving it a one-two punch in terms of audience. This installment provides everything the original game had and adds Friends Challenge. There's no question that Cooking Mama 2: Dinner With Friends provides more Single-Card Download than the original with controls that are just as good, earning it a higher score here. I was, however, a little disppointed in the fact that a Vs Play cooking competition mode was left out. Such a mode was featured in the Wii version of Cooking Mama, but was again left of of the Nintendo DS version. In fact, none of my "Next Game Requests" were done for this title, so I've included them again (below) and added some new requests that are doable with the current state of technology. This game went up a half step, from demo only to demo + partial-recipe challenges. Following this pattern, can we hope to finally see a full-recipe competition in Cooking Mama 3? Maybe then a multi-recipe meal in Cooking Mama 4? We'll just have to wait and see. If you can play a full-length sporting event via Single-Card Download, anything is possible! Allow for the creation of original recipes (that can also be downloaded). Permit players to design new ingredients/garnishments/decorations that can be included in original recipe downloads. Include a full-on Single-Card Download Vs Play "Cooking Competition" mode. Provide an option for additional recipe downloads via Nintendo Wi-Fi Connection and make them Single-Card Download compatable. Add a multi-recipe "Make-A-Meal" competition. 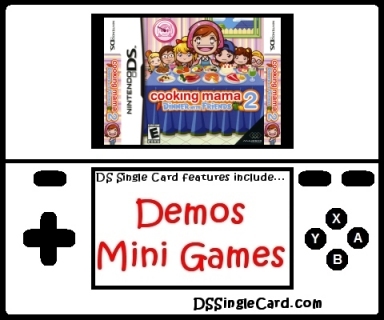 Click here to return to the DSSingleCard.com Cooking Mama 2: Dinner With Friends profile.